A growing number of Americans is protesting invasive Border Patrol checkpoints deep inside US territory by refusing to answer questions, and posting online their recordings of harassment by officers. More and more YouTube videos document citizens’ resistance to the Border Patrol at checkpoints throughout the 100-mile zone along US borders. In some cases, motorists are waved through. In others, they are violently arrested and detained, simply for refusing to answer questions or consent to searches. In one example, cited by Houston Chronicle reporter Dane Schiller, a Texas truck driver was forcibly removed from his truck, arrested and held for several hours after telling officers he was “opting out” of discussing his citizenship. Navy veteran Thomas Sauer, 26, says he lost his job as a result. As he was being arrested, “they told me I had the right to remain silent,” Sauer told the Chronicle. RT reason "Recording Abusive Border Patrol Conduct Becomes a Thing Among Fed-Up Americans http://t.co/iZ7uBl1Rv7"
Even though Border Patrol agents deleted Sauer’s cell phone video of the encounter, he was able to retrieve it using a data restoration service. The 19-minute video has nearly 150,000 views on YouTube. Rick Herbert of California, who refused to consent to move his car into an inspection area and have it searched, was dragged out of the vehicle in front of his crying wife and 4-year-old son. Border Patrol cannot legally pull motorists from vehicles just because they refuse to answer questions, James Lyall of the American Civil Liberties Union told the Houston Chronicle. “Everyone has the right to remain silent and can't be compelled to answer,” he said. Roughly two thirds of all Americans – over 200 million people – live within the 100-mile border zone where the CBP is authorized to set up checkpoints. Eleven states are entirely in the zone, as are nine out of ten largest US metropolitan areas. In 2014, Arizona Republic journalists estimated there were approximately 170 checkpoints around the US. 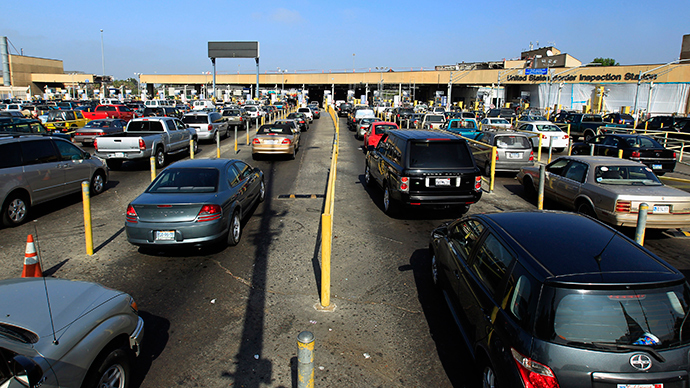 “Our enforcement presence along these strategic routes reduces the ability of criminals and potential terrorists to easily travel away from the border,” reads a CBP pamphlet quoted by the San Diego Union-Tribune in a December 2014 feature. #TeamBuck That clip of "border patrol" harassing citizen at "checkpoint" 100mi inside border makes me So. F'in. ANGRY. Why SHOULD we comply? The US Supreme Court upheld the legality of CBP checkpoints in 1976, but said the agents could only ask about US citizenship. To do conduct further inquiries, they are required to have a probable cause.